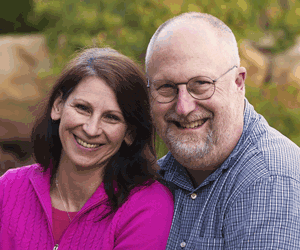 We’re John and Belinda McBade, and this site is about serving God in Japan. If we were to put a title on our little adventure here where we are seeing God do great and wonderful things, we would call it: “Gift of Grace“. So that is why we call our ministry Gift of Grace. We have been Christian missionaries in Japan for a little over 13 years. After praying and waiting upon God for 25 years to be sent out, God’s timing is not always our timing, we truly felt the that our prayers were answered when He finally opened the doors for us to come to Japan. Looking back now, we can see God’s hand in the whole experience of preparing us to be here. We have often felt a bit like Old Testament saints through all of the preparation process, for sure. Our ministry right now is centered in the city of Ome, a small rural community in the north-west part of the Tokyo prefecture. The fellowship in which we serve, Grace Christian Fellowship, is an international mix of Japanese, American, Hispanic, Thai, and Filipino. We are about 15 minutes from The Yokota Airbase, and there are several factories wherein people of many different nationalities work, so we get people from all over the world in our little community. Our fellowship consists of about 60 adults, and a growing number of youth and children. It’s actually rather large for a typical Japanese church. Still, we believe the size is not the most important factor. What is most important is keeping the main thing the main thing – sharing the love of Christ and training up others to walk closer with Him each day. The desire that God has given us is to minister to whomever comes in the door. It seems God brings all manner of folks to Grace Christian Fellowship. The ministry God has given us is not “high profile”, just simple teaching and person to person ministry. We are continually keeping our eyes open and our ears listening, seeking God for what He might do next. Until the day God clearly moves us on, we will remain planted and growing in our little piece of Japan. If you are interested in Japan, or ministry in general, please prayerfully follow along. We also have a newsletter with which we share our adventures in God’s Grace through images and accounts of God’s work through a ministry that seems to reach from one simple little church on the outskirts of Tokyo to people from all over the world.